Abigail Thompson Reeves of Gloucester, NJ worked this delicate and beautifully wrought sampler in the year 1834 when she was 13 years old. Our research tells us that she was the daughter of Joseph Reeves and Mary Gill, who were married on January 11, 1821. She was named after her fraternal grandmother, Abigail Thompson. 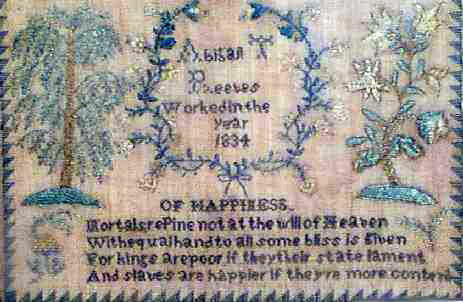 Flawlessly rendered needlework characterizes this charming sampler. There is elegance to the floral wreath that encircles her name and to the trees which flank this wreath. The colors are predominantly blues and greens with ivory and pale gold accents. 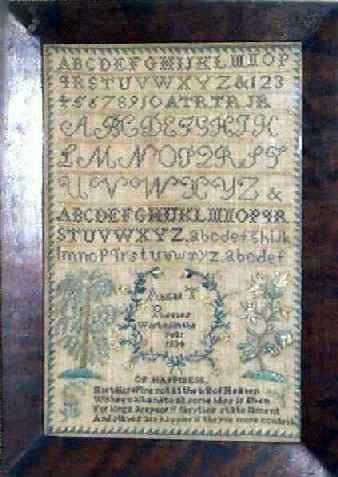 The sampler was worked in silk on linen and is in excellent condition. It has been conservation mounted into a figured cherry frame with a tiger maple bead and protected with Tru Vue glass. Sampler size is 9 1/2" x 14 3/4".